Kids love to zoom around on anything on wheels and what better way to treat your child than to gift them one of the best Power Wheels for kids for their birthday or Christmas! Riding around on Power Wheels gives your child a sense of independence and helps them develop their confidence and social skills while having tons of fun! 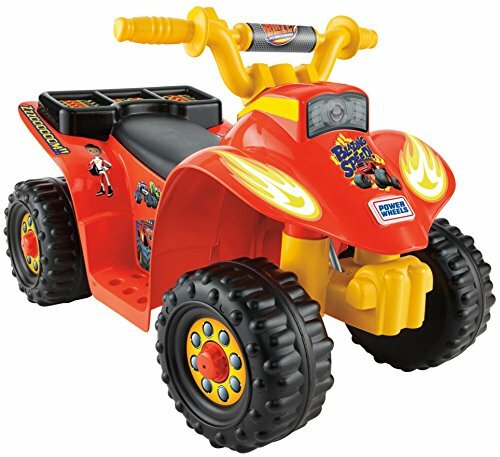 Fisher Price are renowned for their Power Wheels ride on toys and have a fantastic selection for boys and girls of all ages. Our dedicated team has carried out in-depth research on the best Fisher Price Power Wheels available so that we could bring you an awesome selection across a wide range of prices. We’re confident you’ll find something on our list that your child will be thrilled with and will have tons of fun driving around. Kids get a great kick out of being able to do things for themselves and the Fisher-Price Power Wheels Lil’ Quad allows them to do just that as it has ATV styling, built in footrests, and a back cargo rack for hauling things around while they are on the go. The Lil’ Quad has easy push button operation, your child just holds down the button to keep the quad moving forward. This Power Wheels is easy for small children to get on and off by themselves. It only goes 2 mph in forward and does not go in reverse. It comes with its own 6 volt battery and charger and the battery needs to be removed for the first charge. This Power Wheel also comes with a 1 year warranty for added peace of mind. It is recommended for children 1 to 3 years old, but is best suited to kids who are closer to 18 months. This Fisher-Price Power Wheels Lil’ Quad is a fun and exciting toy for young toddlers that will allow them how to test their independence. Several parents shared that while it took their child a while to get the hang of it, one they did, they had a ton of fun driving it! Small children like the fact that they can actually drive their own vehicle, finding it great fun! The Fisher-Price Power Wheels Hot Wheels Kawasaki KFX comes in blue and there is also a Barbie version that comes in pink, making this Power Wheels perfect for both boys and girls. 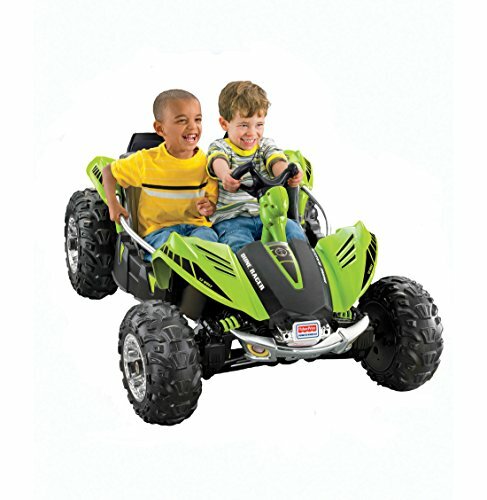 These Power Wheels have ATV styling and runs using a twist grip throttle. These little quads have stylish chrome accents and travel at speeds of 2.5 mph and 5mph and travel in reverse at 2.5mph. There is a high speed lockout so that parents can control the speed at which their younger toddlers drive. These Power Wheels will travel on grass, concrete and rough terrains due to the large plastic tires. While you use the twist grip throttle for slower speeds, there is also foot pedal for your child when they are driving their quad at the faster speed. Comes with a 12 volt battery and charger and recommended for children 3 to 7 years old and with a weight of 65 pounds or less. Parents like that they can set the low speed for their smaller children and then allow for the higher speed as their child gets the hang of steering and matures a bit more. The Fisher-Price Power Wheels Kawasaki KFX is a fun ride on toy for children who want to assert a bit of independence and drive their own vehicle. A number of parents shared that their child loves this 4-wheeler ride on toy and they love driving it around the yard. Parents of younger toddlers shared that it took their child a while to get the hang of turning the Power Wheels, but the delight on their face when they first mastered it was priceless! Perfect outdoor toy for a variety of different terrains, rough, smooth, grassy and more! The Fisher-Price Power Wheels Disney Frozen Jeep Wrangler has realistic wrangler styling and features frozen graphics. This Power Wheels Wrangler also plays portions of songs from the Frozen movies and has doors that open and close. It also has rounded edges for safety, and rear storage so your little one can haul around their valuables and favorite toys. The quad has comes with a 12 volt battery and charger and also uses 3AA batteries for the radio. The Frozen stickers come separately and need to be applied after the Wrangler is assembled. This Fisher-Price Wrangler has two forward speeds, 2.5 mph and 5 mph, and a reverse speed of 2.5 mph. In addition, it has a power lock brake system and will seat 2 toddlers, making it a fun vehicle to share. The Wrangler will hold weights up to 130 pounds and travels best on gravel and concrete, although several parents have replaced the back tires with bike tires so it travels better on grass and on packed dirt. 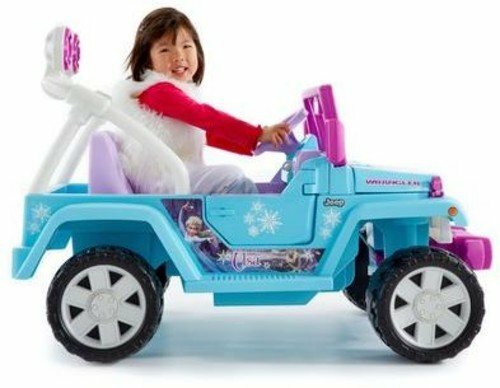 The Fisher-Price Power Wheels Disney Frozen Jeep Wrangler is recommended for children ages 3 to 7 and it does take about 18 hours for the initial charge. Several parents shared that having bought lots of ride on toys for their kids, this one was their favorite because it has the greatest battery life, the best power and tons of space. They also shared that they love the fact that their child can have a friend ride with them for shared play. Perfect gift for any Frozen fan! Your child can have a toddler friend or sibling ride with them for even more fun! This Fisher-Price Power Wheels Lil’ Ford F150 looks like a miniature version of the real thing. The Ford F150 comes with a roomy truck bed, which is great for storage, and big rugged tires. It travels at 3.5 mph in both forward and reverse. The F150 drives on hard surfaces and grass and has an electric breaking system allowing the truck to automatically stop when your child removes their foot from the pedal. Your child will have a great time driving this truck all around in the driveway or backyard, picking up loads of sticks or stones, or simply driving their stuffed animals or dolls around. The F150 comes with a 6 volt battery and charger. Parents do say that this little truck does take a bit of time to assemble, but the assembly is not all that difficult. And that the time invested in assembly is worth it when they see how much their child enjoys driving around in this beautiful truck. This truck is recommended for children 2 to 4 years and can take weight of up to 65 pounds. 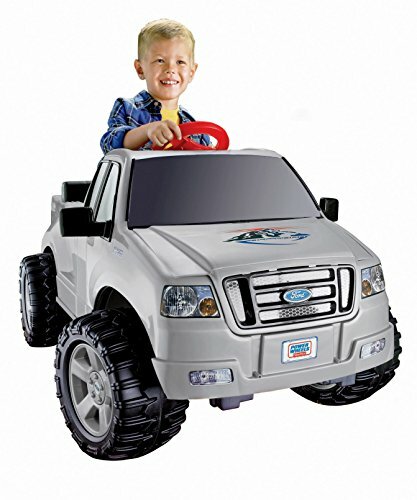 The Fisher-Price Power Wheels Lil’ Ford F150 is a great ride on toy for any child who loves trucks. A number of parents bought this Ford F150 for their son and daughter and they shared that they absolutely loved it! Some parents added headlights and neon lights to make it even cooler looking. Kids find this little truck a whole lotta of fun to drive! The Fisher-Price Power Wheels Lil’ Quad Camo has ATV styling and push button operation. Your child has to simply push the button to go and it stops when your child lets go of that button. The Camo goes at 2mph and uses a 6 volt battery and charger. The Lil’ Quad Camo comes with camouflage colors and graphics. It has wide tires and is built low so that toddlers can get on and off the quad easily. This Power Wheels Lil’ Quad only goes forward as there is no reverse, it’s easy to assemble and has decals to put on. Designed to travel on grass, concrete, and packed dirt, this Power Wheels is recommended for children ages 1 to 3 years old. The Lil’ Quad Camo will allow your child to explore their backyard in a whole new way, while providing them with hours of fun. Parents should always supervise their toddler when their toddler is riding this quad. You should even walk beside them until they get the hang of steering this ride on. 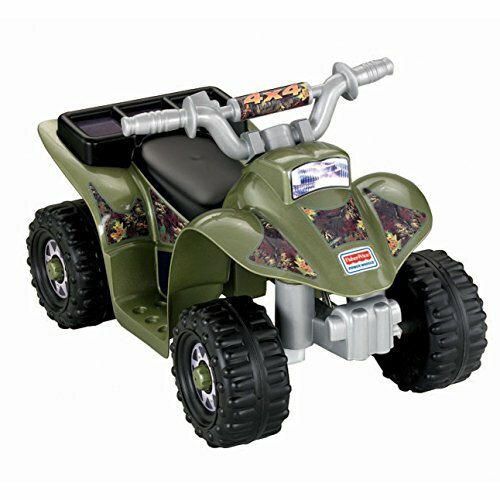 This Fisher-Price Power Wheels Lil’ Quad Camo is a ride on toy that any child is sure to enjoy riding. Lots of parents shared that their child loves driving this quad everywhere! They also shared that they love the fact that it drives so well on all types of different surfaces. Kids find this Quad Camo extremely fun to ride, feeling like they are 4 wheeling in their own backyard! 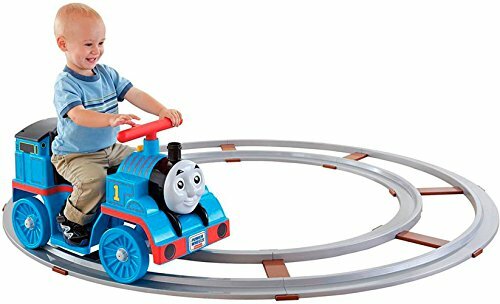 The Fisher-Price Power Wheels Thomas and Friends with Track is the perfect ride on toy for any child who has not learned to steer on their own yet. This train comes with a 6 volt battery and charger and travels 1mph on the track and 2mph off track. The train is equipped with comfortable footrests so your child can sit back and enjoy the ride while pretending to be a train engineer. This Thomas the Tank Engineer will be a vehicle your child will be extremely familiar with. It operates using a simple push button control to start and stop your train. Thomas and Friends Train comes with 18 feet of track and needs 1-AA battery in order for the engine to make sounds. The sounds come from the yellow whistle on the train that produces sounds and phrases which your child will enjoy. Thomas is easy to get on and get off. The track is perfect for any child not yet ready to steer since all your child needs to do is hold down the push button and the train will run around and around on the track. Once they are old enough to get the hang of steering, the track can be put away and the train can be run through the house or even outdoors. Thomas and Friends is recommended for children ages 1 through 3, but some parents find that their child a couple of months younger than 1 can ride the train easily. A number of parents shared that this Fisher Price Power Wheels Train is well worth the money, very entertaining and durable and their kids love it. Kids find having a ride-on train a great deal of fun and love Thomas! 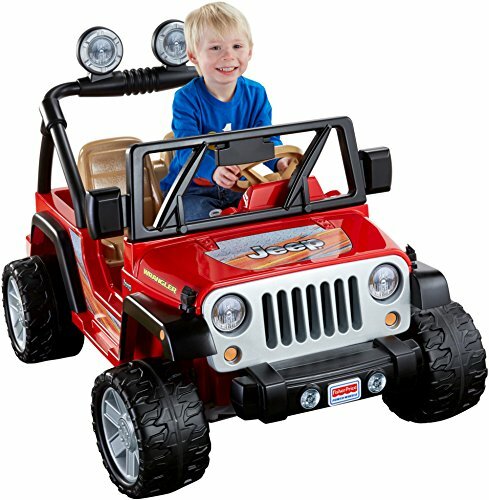 This Power Wheels Jeep Wrangler has realistic Jeep Wrangler styling with a cool grill and roll bars, rugged fenders, auto brakes and wide tread tires. It also has roomy storage and will seat two small children comfortably so your child can ride with a friend or sibling. This Jeep Wrangler has two forward speeds running at either 2.5mph or 5 mph. It only reverses at 2.5 mph. It travels well on hard surfaces or grass, has a high speed lockout, bears a total user weight of 130 pounds, and comes with its own 12 vault battery and charger. This Jeep Wrangler is perfect for any child and sibling or friend who wants to go on that backyard safari or go 4 wheeling around those trees. It’s recommended for children ages 3 to 6, but parents find that smaller toddlers can have fun being a passenger when their slightly older child drives. A simple screw allows parents to lockout the higher speed until their child has their steering down pat and is familiar enough with the Jeep Wrangler to be able to handle the higher speed. Then you simply remove the screw and your child is good to go as fast as the vehicle allows. This Power Wheels Jeep Wrangler is a fun Jeep that toddlers love driving and allows them to engage in all types of imaginative adventures. Several parents shared that their toddler sons and daughters love this ride on Power Wheels and drive it for hours of fun engaged play! Kids have a blast riding this cool Jeep and create lots of fun adventures! The Power Wheels Batman Lil’ Quad is a cute little 4 wheeler that also comes in Paw Patrol, Barbie and Kawasaki designs and graphics, making it a fun little quad for your toddler. These Lil’ Quads have ATV styling which children really love. The quads are easy to drive since they have push button operation. You simply hold down the button to keep the quad moving forward, and when you release the button, the 4 wheeler stops. This Lil’ Quad features a hidden storage compartment, wide tires, comfortable footrests, and is easy for your child to get on and get off. The Quad takes a little time to assemble and to put on the decals, but assembly is not difficult. 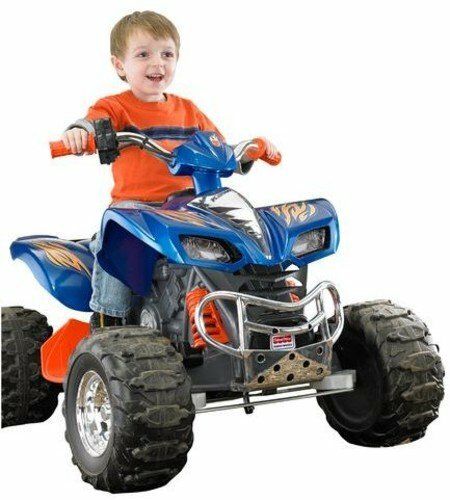 This Power Wheels Quad is recommended for children ages 1 to 3 and comes with its own 6-volt battery and charger and runs forward at a maximum speed of 2 mph. This ATV does not go in reverse. We do suggest that you closely supervise your toddler when they are using this Quad and walk beside them until they get the steering down pat. 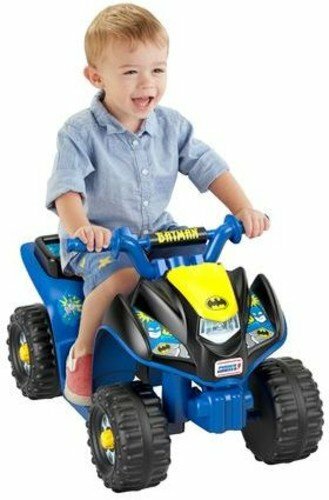 The Power Wheels Batman Lil’ Quad is a great little 4 wheeler that is sure to give them the self confidence to learn more and more new things while having fun playing pretend. Several parents shared that they feel the quality is really good for the price and their child loves riding it and creating their own adventures! Fun for your child as the zoom around the backyard or in the park! What could be fun than Dune Racer and this Fisher-Price Power Wheels Dune Racer is a great little Dune racer for your little one. This dune racer comes in your choice of Green or Lava, with chrome accents to give it a more realistic look. It uses a monster traction system that makes it possible for this powerwheels dune racer to travel over grass, hard surfaces and even rough terrains. This dune buggy travels at speeds of either 2.5 mph or 5 mph when going forward, and 2.5 mph when in reverse. It has metal sidebars for passengers to hold onto, and power lock brakes so the racer stops when you take your foot off the gas. The Dune Racer comes with a 12 volt battery and charger and take 18 hours to charge for the initial time. Recommended for children ages 3 to 7, it’s roomy enough to hold two small children at the same time, so your child can share his or her driving adventures with a friend or sibling. This Power Wheels dune racer does need some assembly, but assembly is not overly difficult and takes only a limited amount of time. 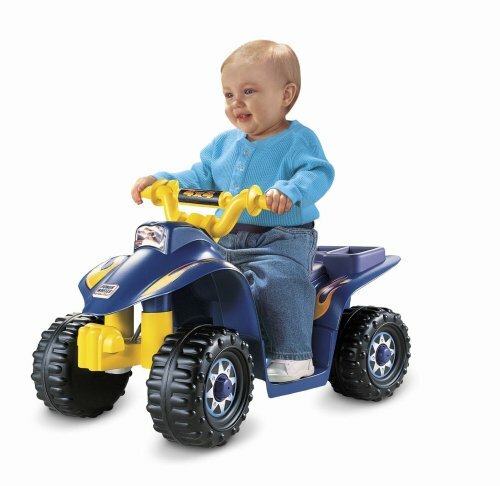 The Fisher-Price Power Wheels Dune Racer is will provide your child with years worth of driving fun. A number of parents shared that this is one awesome power wheels and it really does drive well through all kinds of different terrains! They also shared that their child is still driving it and having fun with it over a year later, so definitely value for money. Small children find this dune racer to be cute and fun to drive! Bursting with color and cool graphics, the Fisher-Price Power Wheels Nickelodeon Blaze and the Monster Machines Lil’ Quad is sure to capture your toddler’s attention and imagination. This cute Lil’ Quad runs only in forward at 2mph and has easy push button operation. Your child simply needs to push in the button on the handlebar and hold it down to move forward. Release the button and the Lil’ Quad stops. It does not go in reverse. With its built in footrests, secret storage compartment, and wide tires that allow your child to ride on hard surfaces and wet grass, this is one tough Lil’ Quad. This Blaze and the Monster Machine Lil’ Quad comes with its own 6 volt battery and charger. Your child will have great fun as they climb aboard their very own monster machine and drive to the rescue, saving the day in a thousand different ways. This Blaze truck is recommended for children ages 1 through 3, and the slower speed gives your child the thrill of the ride while allowing them to learn how to steer. We do suggest that you supervise your child when they are riding this Quad until they get used to it. The Fisher-Price Power Wheels Nickelodeon Blaze and the Monster Machine Lil’ Quad should provide your child with hours of fun as they enjoy the great out of doors on their very own ride on. Several parents shared that this powerwheels quad is a great ride and they love that the charge lasts quite a long time so their child get plenty of playtime riding it. Lots of toddler friendly features to keep your child comfortable and safe, like footrests etc.